Located in the scenic village of Sangolda in Bardez Taluka of North Goa District, Sapana Raj Valley offers all the convenience of modern luxury living in its 2 & 3 bedroom luxury apartments over multiple Stilt + 4 blocks christened Lotus, Orchid, Daffodil, Lily, Hibiscus, Tulip, Aster, Marigold, Poppy, Calandula, Maple, Cosmos, Magnolia, Sunflower, Daisy, Dahlia, Lavender, Blue Bell & Violet. Each and every apartments is specifically designed to the highest finish with ample space and the best in design and appearance. 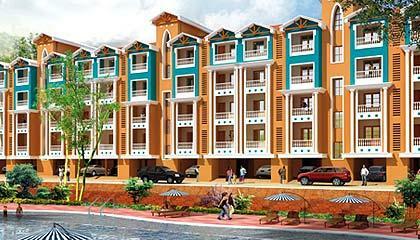 Sapana Raj Valley also offers a wide range of amenities. Be it an invigorating dip in the pool whilst your kids are thoroughly entertained with a kids play area, or a relaxed walk in the beautiful landscaped garden or an evening being entertained in our fully euipped club house, Sapana Raj Valley will surely add up to your expereience of living a serene life.